This has been my sushi spot for YEARS. Located a couple blocks from my house, Banzai sushi was my “go-to” sushi spot in high school. Whenever I’m home and am craving sushi, I go to Banzai. Banzai is in Calabasas, right across from the famous Sagebrush Cantina, and also down the street from the Calabasas Commons. Sushi is one of my favorite foods, so I love a good sushi spot. I wouldn’t say Bonzai is the best sushi restaurant out there by any means, there are better places for sushi, but I really like Bonzai. It has a nice vibe, inside is always packed, and the outside heated patio (the patio is covered during winter) has flat screen TV’s that usually always has a sports game on. I usually like sitting on the patio. 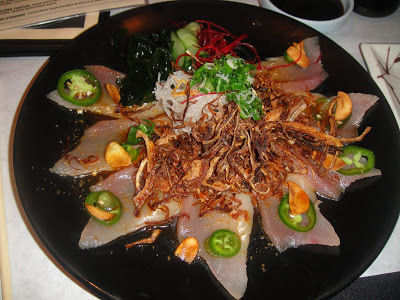 Special Albacore Sashimi. So flavorful and fresh tasting! If you are ever in Calabasas and want sushi, Banzai is one of the good spots to go to.